Copley was the son of Irish immigrants and, probably, was born in Boston, USA. He begins to draw as a kid and, as a teenager, he rejects the job his parents hope from him: to work in his family tobacconist shop. In that time, only the ones who belonged to the upper class were in touch with art. And Copley, although since he was 15 was painting portraits of the characters of his village, didn’t even had the chance to see the work of the great masters until he was almost 30, according to the version of his son, Lord Lyndhurst. The young Copley, then, had to learn the manners of the high society to insert himself in the artistic world. He then meets the Izards, a couple from Britain, with whom he starts a good relationship. This couple invites Copley to their grand tour, this is, to travel across Europe for months, a custom of the wealthy at that time. 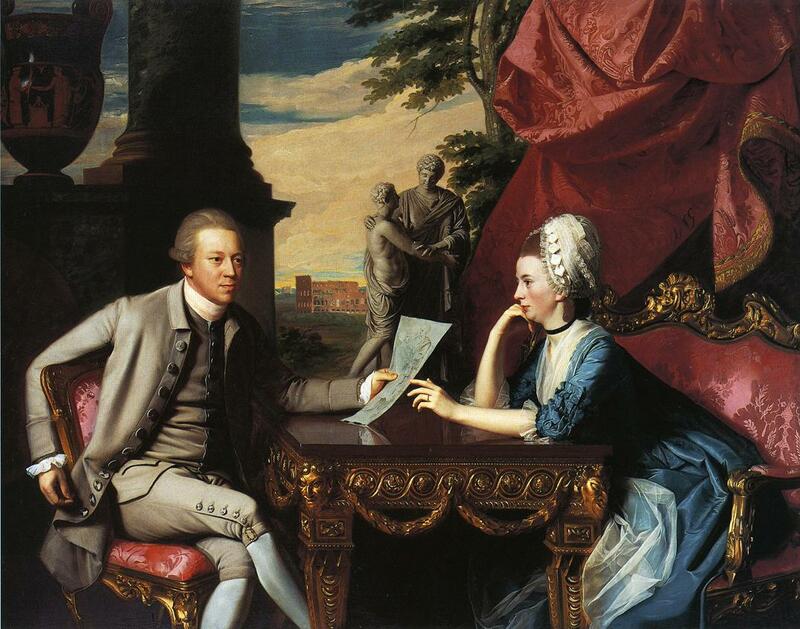 After passing by Rome, Copley paints the portrait of the couple we see today. Here, we see the Izards sitting on a table with and odd background in where, presumably, we see the Roman Coliseum. But if we pay attention, we would notice that the whole composition has a surreal feel. The couple seems to be sited outside, because we see a column and a outdoor background, but then we ask ourselves: ¿What is it doing a curtain on the left area of the canvas? O ¿aren’t the furniture expensive enough to be place outside? The answer to these questions is little interesting but curious: in those days, the custom when doing the grand tour was to buy a lot of antiques and then, after acquiring a lot, to be painted next to them. That’s why the work we see seems to be a horrible collage of different objects: a near east vase, a column, a statue, curtains and an expensive set of table and chairs. And, also, of course, Mr. Izard holding a drawing in his hand while his wife points at something that, evidently, seems not to interest her partner. ~ by Álvaro Mazzino on November 24, 2010. You’re English could really use some improving, especially in verb tense consistency. This article was incredibly awkward to read…. Yes, maybe. But at least I know when to use “your” instead of “you’re”. I want to know more about Alice Delancey. Anyone? @ Danny. Alice deLauncy was a Charleston Huguenot family. Her nephew , born in New York, was Wellington”s aid at Waterloo. He was killed by a cannon shot. Bartolommeo Izard was one of Napoleon’s artillery officers. This entry was posted on November 24, 2010 at 16:52 and is filed under Rococo.You can follow any responses to this entry through the RSS 2.0 feed.You can leave a response, or trackback from your own site.